Trail Wolf tires by Carlisle are a simple & affordable OEM style tire that is available in several sizes to fit many quads. It is the OEM tire of choice for Yamaha & Can Am. The tread design offers a nice smooth ride and provides excellent grip on basic terrains. 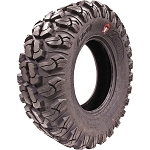 This tire is ideal for general trail riding and works well with smaller utility & sport ATVs. Carlisle has been one of the leading tire manufacturers for many years. 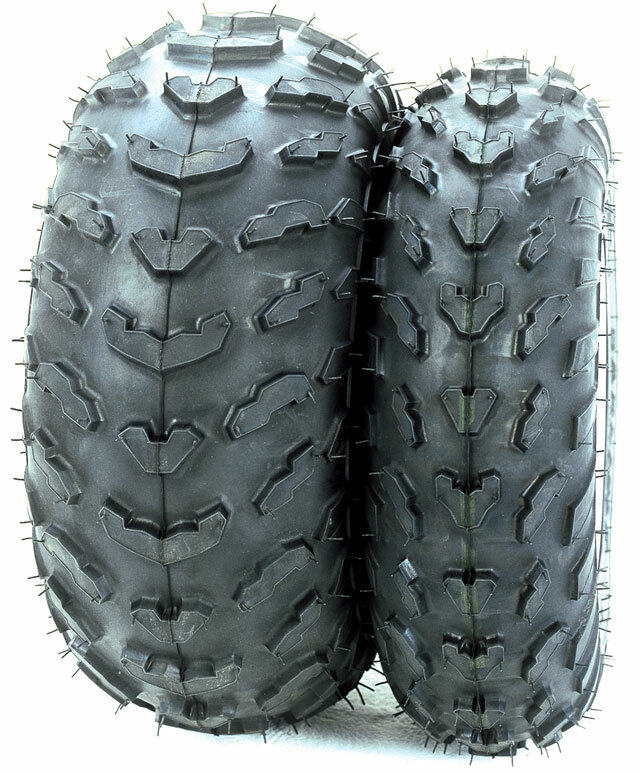 - Our Trail Wolf tires generally ship out within 1 business day! - Great OEM replacement tire for trail riding. - Offers many hard to find sizes for older and late model ATVs. - Harder rubber compound means you realize better wear and longer intervals between replacement. - The Carlisle Trail Wolf is a great choice for durability and price. Excellent product, great price, couldn't believe how fast they were on my doorstep. Within two days of ordering I had them. Great value, couldn't find a better price anywhere. My kids liked the aggressiveness of the tires. I would buy them again when these wear out. The tires are good quality and I was amazed at the speed with which I received them. I placed the order on Sunday and by Monday morning I already had a shipping notification. The tires arrived at my door Tuesday afternoon and I had them installed Wednesday afternoon. Amazing! I ordered these on a Friday night and they were delivered on Monday. Purchased for a Suzuki Ozark to replace worn stock tires. They fit perfect and look great. They have plenty of bite for rocky hill climbs and muddy, slippery descents. I would recommend them. Picked up a set fronts 20-7-8 and 20-11-8 rears for my grandsons Sportsman 90 as the little stocks just have no bite to them. These tires really have helped his little 90 come alive! Great Deal! Best price anywhere! Fast Shipping! Great tires should last for years on my Honda Recon. These tires were limited and hard to find. You had them in stock and shipped right away. I received them 3 working days after I ordered. Thanks a lot. I'll put you in my "favorites"! 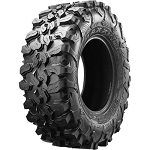 ORDERED 2 TIRES FOR JD 6 X 4 GATOR. VERY PLEASED WITH SPEED OF SHIPPING. TIRES ARE GREAT. ORDERED 2 MORE FOR FRONT, WHICH ARRIVED NEXT DAY! Perfect for the Weekend Warrior!!! The take my 250 Bruin through anything: mud, rocks, sand, gravel... If Im in mud I lower the pressure to 2psi and they provide amazing traction and side bite!!! Q: Are these tires tubeless? My current Carlisle tires are tubeless and I wasn't sure if it would work the same or not. Q: What is the Weight of 22*7*10 ? Q: is this a a 6 ply tire? A: No, these are more like a 3-4 ply rating. Carlisle doesn't use ply ratings, they use star ratings. This tire has a 3 star rating. Q: how many ply's and load rating ? A: The info you are looking for will vary depending on the size. Which sizes do you need this info for?